Posted by admin on September 16, 2010; This entry is filed under Brazil, Project Introduction Text, Rio de Janeiro, UFRJ Restaurant, UFRJ Restaurant > Rio de Janeiro > Brazil. 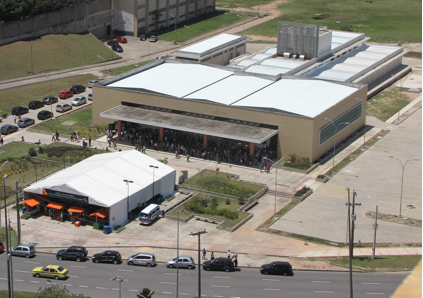 The University Restaurant was opened in 2009 and represents a joint effort of the Administration of UFRJ and Institute of Nutrition Josué de Castro / UFRJ. 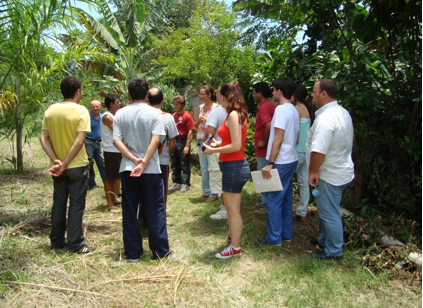 With the focus of interdisciplinary the project attracted also the UFRJ Innovation Agency, the Graduate School and Research in Engineering (COPPE/UFRJ), family farmers and its representative bodies, the student group Lemongrass and the university community. The project goal is to define a food supply following the principles of Good, Clean and Fair advocated by the movement Slow Food and aligned with the policy of Food Security and Nutrition of the Brazilian federal government. This goal is based in the following statement: an restaurant placed in a university should not only provide food to students, it should be a place of food education. All service done at the restaurant must express this education: from the origin of the food (good, clean and fair) and contact with farmers to the gastronomic issues, from the recycling procedures to the welfare of workers in the restaurant, and so on. Located on the campus of the largest federal university in Brazil (the UFRJ) the University Restaurant currently distributes 2500 lunches at a subsidized price of $ 2.00. The UFRJ Master Plan is targeted to reach 30000 of meals per day by 2020 (building new restaurants all over the Campus). Today the food preparation in the university restaurant is outsourced and, therefore, it is defined by the contracted company based on an industrial approach to food provision. The goal is that, through the series of actions described below, the notion of what a University Restaurant could be changes and, consequently, the food provided in the restaurant as the next call for provider is arriving. The restaurant described here is called “Central”. All actions in this restaurant therefore are examples to the other restaurants to be built following the UFRJ Master Plan, and not only: also to other university restaurants in Brazil. This project therefore proposes a pilot, trying also to strengthen the dialogue with other Brazilian universities to further discussion on the legal processes in driving innovation in university restaurant management, particularly those in the public sphere. With approximately 60,000 people per day, with about 1/3 of that total consisted of students, the university campus is a real city. Situated in this city and context, the University Restaurant has thus become a privileged pole for discussion and dissemination of information on processes involving the production, acquisition, preparation and delivery of food. The project here strengthen the image of a university that apply the knowledge it produces and practices the social and environmental commitments it advocates. The sub-projects implemented were derived from the dialogue with other stakeholders in the food production chain, trying to provoke in the final recipients, who frequented the restaurant, a thought about his responsibility as co-producer of food. Vision: The design of the UFRJ Central University Restaurant intends to set up a food service model that collects, organizes and strengthens social innovation initiatives around food provision in the Campus, articulating the university community (students, teachers and workers) and external community (small food producers) in the view of good, clean and fair food. - Establish collaboration with other University Restaurants managers across the country, to be started up through the planning and execution of the First “Meeting of Federal Universities Restaurants” . With attention to limit the generation of garbage the service provided in the Restaurant do not use paper to cover the tray and not even plastic bag to protect silverware, commonly found in industrial-sized restaurants. In the Restaurant selective collectors are available for users to separate paper (napkin) and plastic (cups), being the organic material separated by the outsourced company employees. After an educational campaign, the willingness of students reaches 90%. Students now enrolls initiative for the replacement of disposable cups for plastic washable ones, brought by them. It will reduces the environmental impact derived from the daily discharge of about 2800 cups / day. At present the Restaurant send their cups to an autonomous cooperative of recyclers of Rio de Janeiro and seeks partnership for the disposal of organic waste. With the idea of purchasing organic foods to make up the menu served in the Restaurant, it was organized an Agro-ecology Fair to get proximity with family farmers, to know them and to start up to map potencial providers to the project. The fair started six months ago and brings together every week small organic farmers from eight regions of the state of Rio de Janeiro. It is held in the Restaurant gardens and in the hall of the Rectory building. 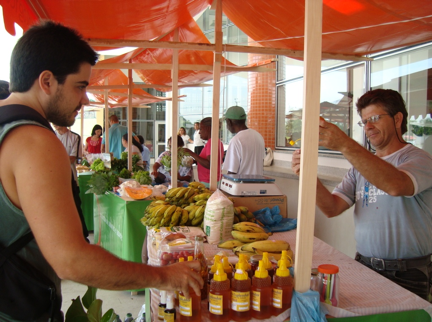 The fair promotes direct sale channel to the farmers but, also, it has fostered dialogue and exchange of experiences among farmers, farmers / consumers, and farmers / administration and faculty of UFRJ. Participatory management was adopted in the fair project: the regiment for the operation of the fair was built collectively. Periodic meetings are organized with producers, coordinated by the Restaurant director with support of teachers and students. The participants identified as key issues: the legal obstacles for the certification of their food production (as organic) and lack of knowledge about food labeling, processes and logistics. The Department of Social Services in Rio de Janeiro Municipality gave Vote of Support to the project, recognizing it as an important initiative on Food and Nutrition Security in the city of Rio. The Extension Conference held at the Federal University in October 2010, the work with farmers at the Fair was nominated as one of the best works presented at the event. 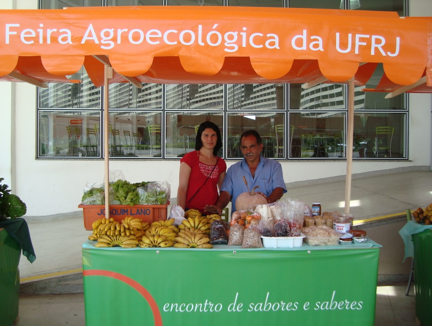 Future actions includes to map the potential organic farmers to supply the University Restaurant, and study the legislation in the public sector to allow this specific type of qualitative food purchase (the UFRJ is a public university). The importance of interpersonal interaction to promote a warm meal time, a pleasure moment to users, pointed out to the necessity to focus on the Restaurant workers, which form the service front line. It was defined that the the promotion of pleasurable activities to employees of the outsourced company, could generate a positive atittude and a good disposition in them to relate to users. It was carried out research on the extra activity required by the group of workers. The triggering point for the respondents was “what UFRJ could offer to make you happier?” English class and computer activities were cited as desirable, but the majority chose to dance class. 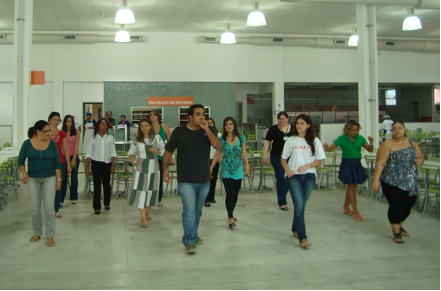 It was made a partnership with the School of Physical Education in UFRJ, particularly the Project “Comunidança” who performs in the Restaurant, twice a week , the ballroom initiative called “Employee + Happy” in which, for 50 min, 20 of 32 employees of the outsourcing company learn to dance different rhythms. After six months of the initiative was realized a better understanding between team members and these with your supervisor, which also participates in the class. The meeting is held each year, in two days, and takes place in the gardens of the Restaurant, arranged in tents in which farmers, artisans and university researchers expose democratically their flavors, aromas and knowledge. Cultural activities and dissemination of initiatives for social innovation in various areas also have a guaranteed space at the event, as for example collaborative enterprises promoted by artisans. In its second edition (2010) the event was incorporated in the Week of Science and Technology UFRJ, being included of the official calendar of the University. In the event the university community has the opportunity to have access to studies and actions on the issue of food, and the opportunity to buy good, clean and fair food, thereby contributing to the reflection and strengthening of family farming in the state of Rio de Janeiro. 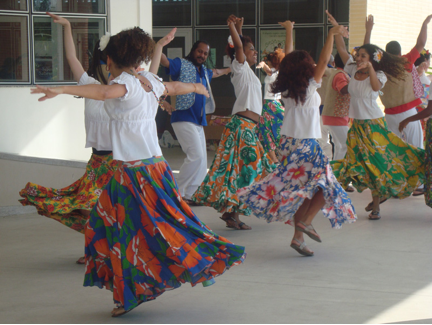 Visitants have the opportunity to celebrate and reflect about the World Food Day (October 16), and to participate in traditional dance performances.